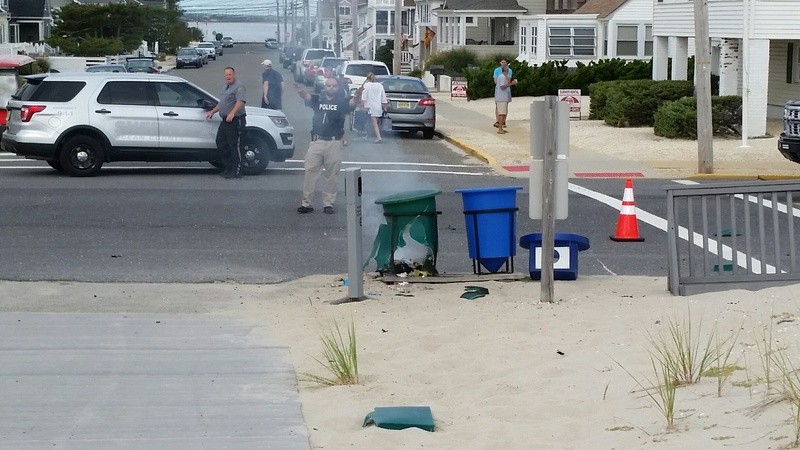 The Seaside Park boardwalk is closed and police K9 units and a bomb squad have been called to the scene around D Street after some type of device detonated. Shorebeat obtained a photo of a device smoking in a trash can. Other reports said an explosive device in a backpack detonated. It was unconfirmed as to whether there was a single or multiple detonation. A possible second device was found at about 11 a.m., police communications indicated. Federal agents from the ATF and FBI were en route. The Semper Five Marine Corps 5K run has been postponed. “The entire town is basically on lock down and being evacuated,” one witness said via social media. “The boardwalk and all the nearby roads leading to the boardwalk were closed in the area,” said Amy Costello, a witness who wrote to Shorebeat.